The original company was formed in 1946 under the title The Scale Model Equipment Company Limited to manufacture scale models and detail parts for the model engineering trade. During the 1950's movement was away from model making to precision engineering, principally parts for aircraft instruments and business machines. In 1959 Alastair Robertson-Aikman, the Company's founder, required a pick-up arm for his own use and an experimental model was built. 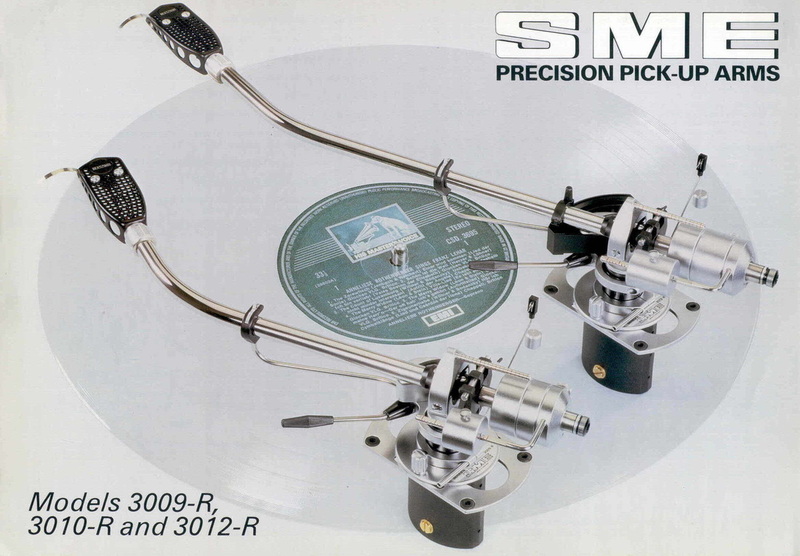 It received such an enthusiastic reception from friends in the sound industry that it was decided to produce it commercially and the first SME precision pick-up arm appeared in September 1959. 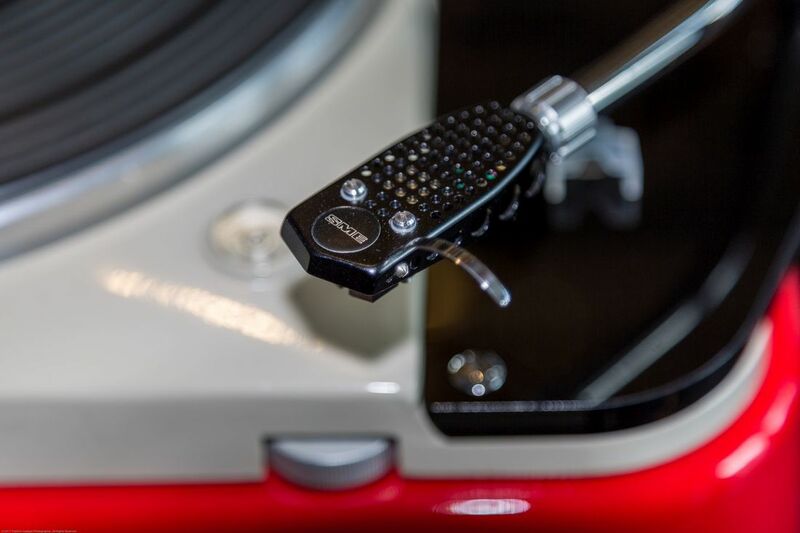 Production was 25 units per week composed entirely of individually machined components. At this time a new factory situated in Mill Road, Steyning was opened and the Company's name was changed to SME Limited, a less committal title to suit its new activities. 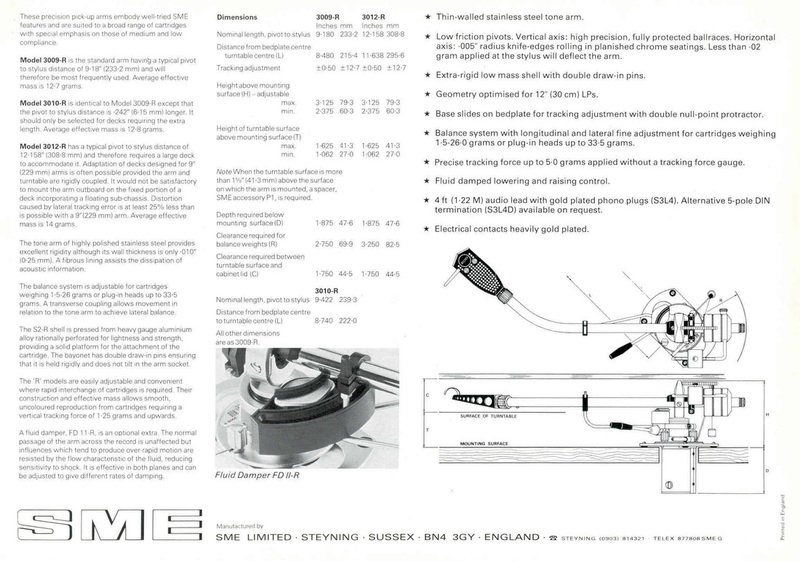 SME now has over 60 years experience in high quality precision engineering and the Company's plant at Steyning is now probably the largest and best equipped devoted to the manufacture of precision pick-up arms and turntables. 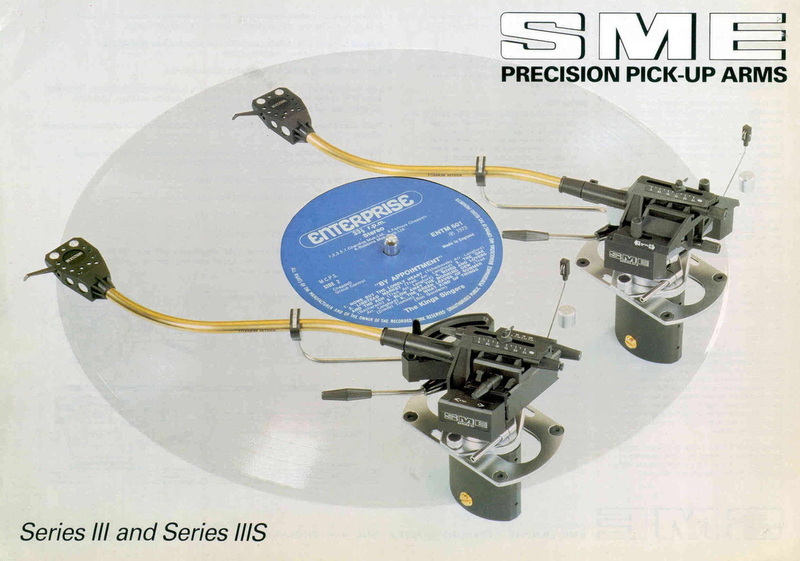 The present manufacturing programme consists of five precision turntables and twelve standard pick-up arms which together with special models offer a very wide range of application.SME precision pick-up arms are exported to almost every country of the world and are available through agents supported by direct service from the factory to the customer. (one : up to 2.5g, both : up to 5g). Lateral balance is adjusted by changing the distance of the outrigger from the main counterweight. Antiskating adjustment by thread and weight, long axle with 10 notches. 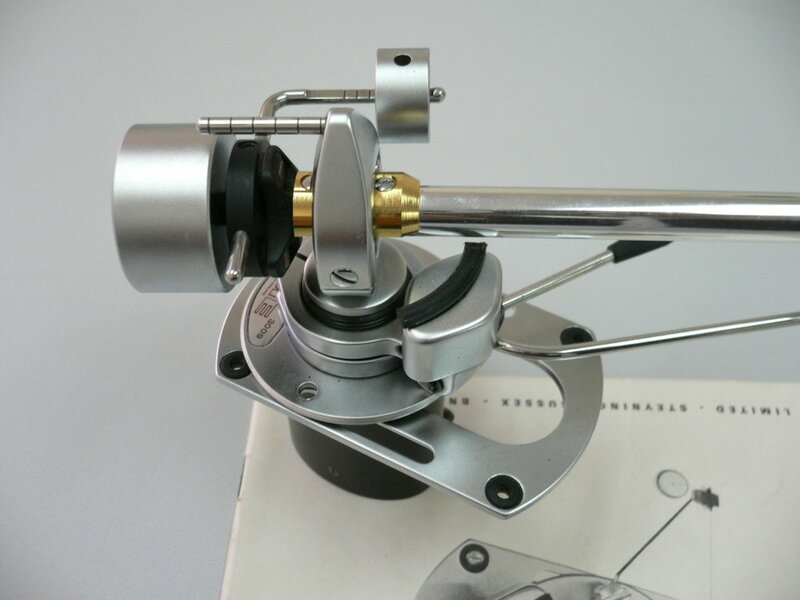 Shortly after SME went out of production with the Series II tonearms the Improved was introduced. There were two versions - with fixed or detachable headshell - but the arm was available in 9" length only. The Improved was intended for the use with high-compliant cartridges and had therefore a quite low effective mass. 3009 Imp: fixed headshell. 3009 S2 Imp: detachable headshell. Aluminum arm tube, effective mass 6,5g (3009 Imp) or 9,5g (3009 S2 Imp). Nylon knife-edge bearings. One-piece disc-shaped counterweight, threaded. VTF set using outrigger, one weight. VTF range: 0 -1.5g. Lateral balance is set by adjusting the position of the outrigger relative to the main counterweight. Antiskating adjustment by thread and weight, short axle with 6 notches. Null points : 66 and 121mm. 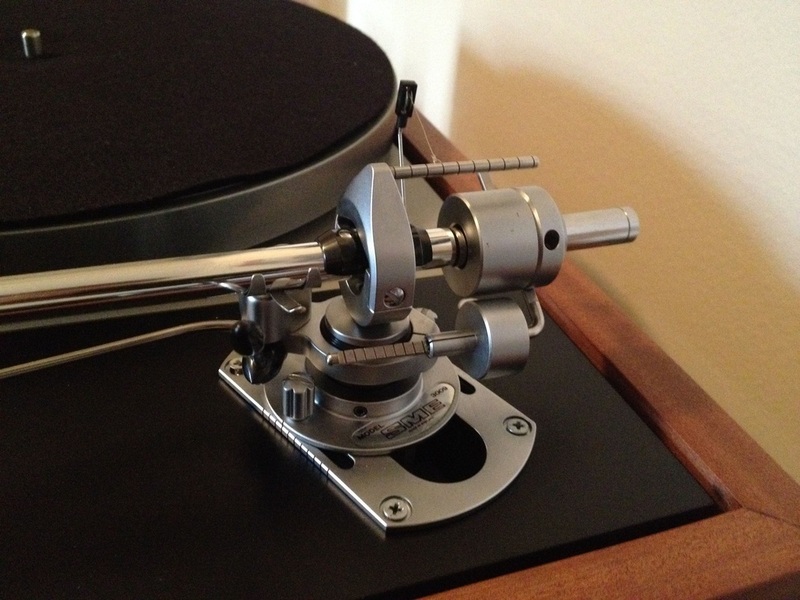 Mounting distance (bedplate centre to turntable centre) : 215,4mm. The differences to the Series II arms are easily recognizeable by looking at the weights. 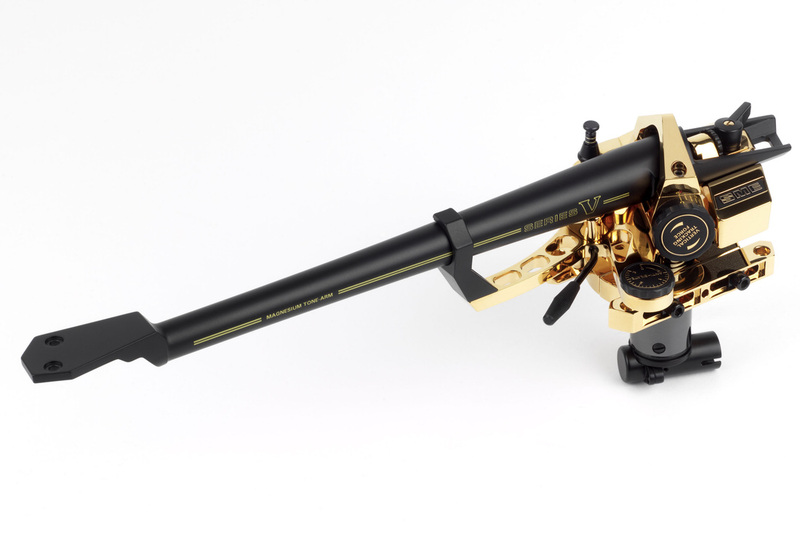 Since a lot of users found the Improved arms inferior to their predecessors and due to their lightweight construction it turned out to be unsuitable for low-compliant cartridges like Ortofon SPU or Denon DL 103 SME decided to produce a new series of heavier tonearms again (from 1981). 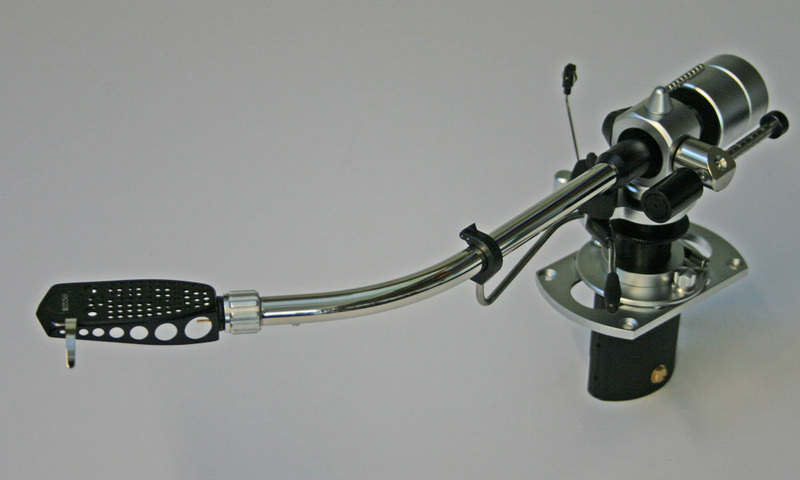 Stainless steel arm tube (thickness 0,25mm), Nylon knife-edge bearings (steel bearings as upgrade available). Effective mass 12,7g (3009-R), 12,8g (3010-R) or 14g (3012-R). Barrel-shaped main counterweight. 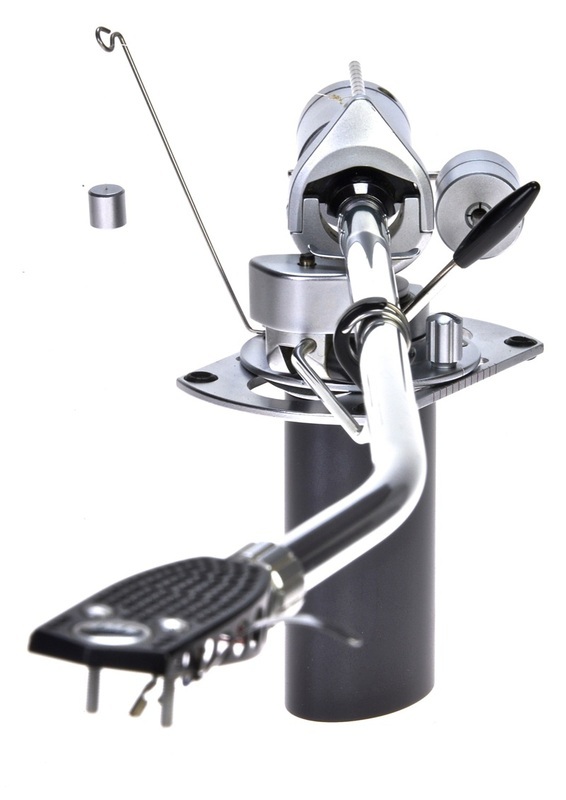 Main counterweight position can be adjusted by turning small knurled dial at rear of arm. 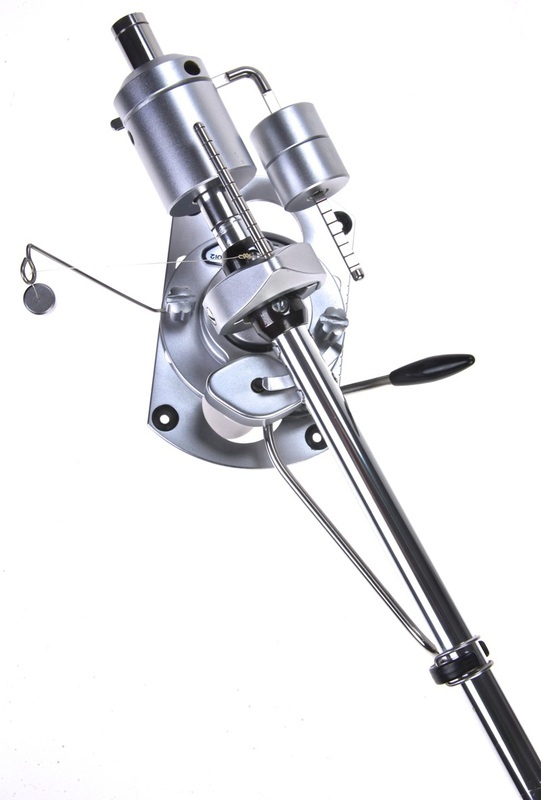 Main counterweight can be split into two pieces to change the range of acceptable cartridge mass (two different removeable pieces are available : 64g, 77g). Can be used with very heavy cartridges (up to 32.5g). VTF set using outrigger, one weight. VTF range: up to 5g. Lateral balance is adjusted by turning an allen key which moves the entire counterweight / outrigger assembly relative to the main arm tube.